Today, in almost every industry, sustainability is a major focus. It seems that the cut flower industry gets special attention, though, because a lot of production occurs in parts of the world where natural resources can be limited. Among the various aspects of sustainability, water usage is a chief concern. We’re happy to report that Floralife is out in front on the issue! Floralife® Water Wise is a global sustainability program which includes product, protocol and process that promote water conservation, labor savings and solutions savings for the Floralife customer who uses Water Wise products. We offer Water Wise products for Hydration, Storage and Transport, and Feeding. 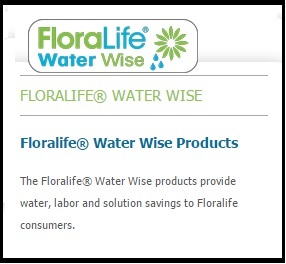 We invite you to take a look at the Floralife website’s Water Wise page. Get to know the products that will benefit you in your own sustainability efforts throughout the cut flower chain. Sound good? We hope so. How about you? Where are you in the flower chain? Do water usage issues affect your business? Wahat are your challenges, and how are you addressing them? Leave us a note in the comments section, and have a great weekend!